Development and deployment platform for creating mobile apps faster and more efficiently. 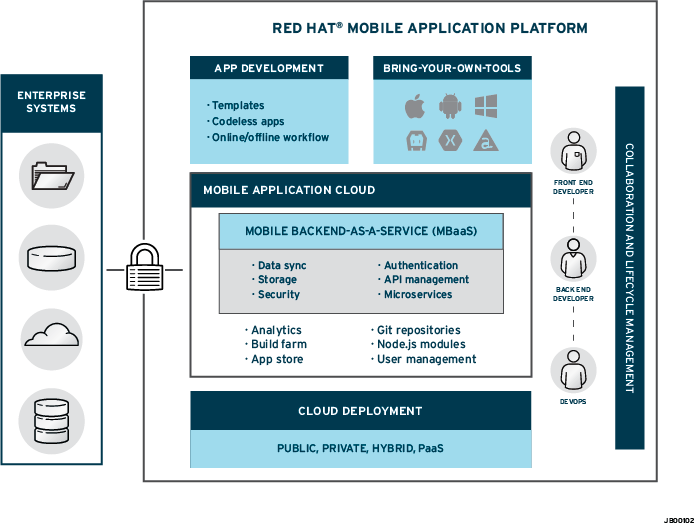 Red Hat Mobile Application Platform lets organizations extend their development capabilities to mobile by developing collaboratively, centralizing control of security and using back-end integration with a range of cloud deployments. Mobile developers can work using the toolkits you know and like. You can discover and use and reuse MBaaS services to connect to common cloud services as well as integrate with enterprise systems, which gives you more time to spend on building your apps. You can write code on our platform to offload work from your app. Your teams can work concurrently on multiple app projects and maintain your agility, security and coordinated workflow processes. Use the tool that’s best for the job and choose to work locally or in a hosted studio. Credentials and certificates can be easily transferred and the hosted Build Farm services supports builds for iOS and Android. With Mobile Backend-as-a-Service (MBaaS) based on open technologies and Node.js you can quickly integrate mobile apps with back-end systems giving you time to create new apps. Choose whether you need AES/RSA APIs for encryption based on the application; and user security and authentication can be managed using user credentials. You can rest easy knowing your app has additional security built in. Drag and drop forms and use of existing templates gives you a head start so you can build mobile apps more quickly. A cloud agnostic architecture lets you choose from a wide range of cloud deployments lets you meet your enterprise requirements.